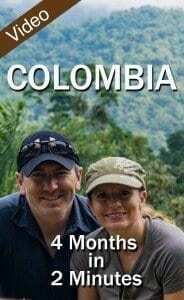 We have loved our four months of travel and living in Colombia and we have a countless number of stories and magical moments to share. We came to Colombia in November and its beauty blew us away; it’s an opportunity for entrepreneurs like us. Colombia has the most hospitable and friendly citizens we have ever met during our many years of travel. Colombia has been at war with itself for 50 years with guerrillas and paramilitaries, impacting millions of Colombians by the loss of family, friends, and displacement from their homes. However, since 2006, there is a massive transformation and optimism for a more peaceful future here. Despite all this, it is in the past, and your view of Colombia should be of its incredible biodiversity, national parks, colonial towns, coastlines, music, art, festivals, dance (salsa!) and its transformation into a very liveable and friendly country. So, in our typical fashion of summarizing our longer stretches of travel, like this one from 2015, we share with you some of our finest moments, events, experiences, and breathtaking views we have seen from Colombia. A special thank you to ViaColombia , they are great hosts, and offer incredible trips around the country. We spent three wonderful months living in Medellín and Envigado- the city just on the outskirts of Medellín. – The city of eternal spring truly has a temperate, comfortable climate with the best views of the surrounding Aburrá Valley. – Surprisingly, you can hike up the valley to find some of the quietest and crystal clean rivers, rainforests and waterfalls. – Medellín is perfect to watch their favorite pastime- Football, as they are some of the most passionate fans, you will ever see that alone is worth the price of admission. – There isn’t fruit as there is in Colombia, especially if most of your fruit is flown into North America or Europe. The markets are full of colorful displays of exotic Maracuya, Guanábana, Lulo, La uchuva, Granadillas, Maracuyá (Passion Fruit), Tomate de árbol (Tree tomato), and Pitahayas (Dragon fruit). With its mix of African/Caribbean and Colombian vibe is as hot as the weather. The walled city of Cartagena is not to miss for a great wander and cool down with an icy glass of lemonade de coco. Tayrona National Park – Is one of the most popular and prized possessions of Colombia. It is North Caribbean coast park, 12,000 hectares of land below the Sierra Nevada de Santa Marta mountains, and hugging the Caribbean coast across 3000 hectares. – Is an eclectic town that has become a force for hiking, bird watching and relaxing, way up in the Sierra Nevada mountains overlooking Santa Marta. – The Lost City in Northern Colombia, a four-day hike to see the ruins of the ancient and extinct Teyruna people. This was one of our most favorite hikes, given the dramatic changes in scenery. More content to come on this incredible hike! – Some of the coolest colonial towns (pueblos) we have ever seen and Colombia has ample numbers of these small, colonial, characterful spots to watch local life go by. Notables include the Colorful, lakeside town of Guatapé, The White City in the south in Popayán, Santa Fe de Antioquia and Jardin to see the Cueva del Esplendor – the Cave of Splendor. – Also known as the coffee zone, or Zona Cafetera, includes the town of Salento. It is a touristy town to enjoy some of the best coffee and food from the southern region. Most guests come to see the Valle de Corcora – where wax palm trees grow upwards of 50ft high. Took us by surprise, the big city of 10million is thriving with the best restaurants in the country, an active nightlife, the stunning old town of Candelariá, the gold museum, and not to miss the Salt Cathedral of Zipaquirá outside of town. – The highest rated coffee comes from this place, and it is also home to the Unesco World Heritage site of tombs of ancient Pre-Colombian inhabitants over 2000 years old. There is no shortage of places to see and things to do in this diverse country. Sit back, enjoy the video and admire the views! If you want to see all our stories, videos, and tips about Colombia, you can find them here.